Jazz saxophonist and current Instructor of Saxophone and Coordinator of Jazz Studies at California State University – Stanislaus, Eastman Alum and Arts Leadership Program certificate recipient Matt Pivec talks about how he became interested in ALP and how it changed his career options. Saxophonist Matt Pivec has explored many different musical styles. As a classical musician, Matt has given recital performances throughout the United States. In 1999 he recorded many of Michael Cunningham’s recital pieces for saxophone. During the project, Matt demonstrated his versatility by recording works on soprano, alto, tenor, and baritone saxophones. In 2003, he gave the world premiere performance of Michael Hay’s Blues in Three Parts. His most recent project, a collaboration with Darin Wadley, features an entire program of repertoire for saxophone and percussion. As a performer of jazz and popular music, Matt has worked with Ray Charles, The Temptations, Peter Erskine, Maria Schneider, the Rochester Philharmonic Pops Orchestra, and the national touring companies of Hairspray, 42nd Street, and The Producers. As a band leader and soloist, Matt has performed at jazz festivals and venues throughout the United States. His most recent jazz recording, Live at Snider Hall, will be released in the fall of 2007. 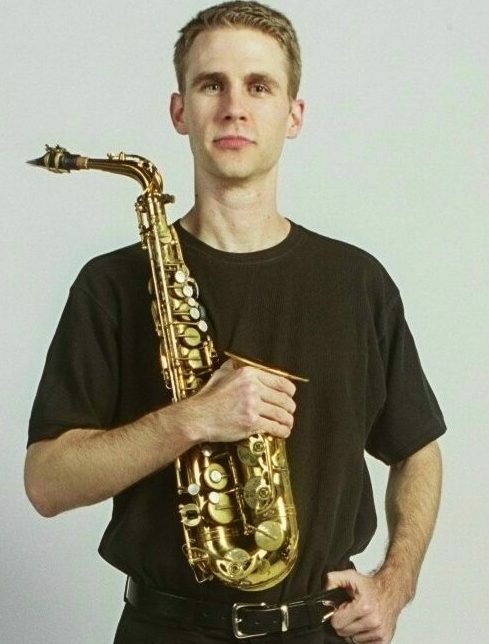 Matt received the Doctor of Musical Arts (Saxophone Performance and Literature) and Master of Music (Jazz Studies and Contemporary Media) degrees from the Eastman School of Music in Rochester, New York. While at Eastman, Matt studied the saxophone with Ramon Ricker. He also performed in several ensembles including: the Eastman Wind Ensemble, the Eastman Graduate Saxophone Quartet, and the Eastman Jazz Ensemble. He received several student honors including the outstanding blues/pop/rock soloist from Downbeat magazine, the Arts Leadership Certificate, and the Outstanding Teaching Assistant Award. Matt received the Bachelor of Music Education degree from the University of Wisconsin-Eau Claire. There, he performed with the UWEC Wind Ensemble and the nationally acclaimed Jazz Ensemble I, which was recognized twice as the top collegiate jazz ensemble by Downbeat magazine. Currently, Matt is the Instructor of Saxophone and Coordinator of Jazz Studies at California State University – Stanislaus. In 2006 he was named “Junior Faculty Member with Exceptional Promise” by the CSUS College of Arts, Letters, and Sciences. In 2006 Matt also founded the Stanislaus Youth Jazz Orchestra, a select jazz ensemble comprised of high school students from Stanislaus County. Prior to his appointment at CSU – Stanislaus, he taught at Cornell University and the University of Wisconsin – Stout. A committed educator, Matt enjoys teaching saxophone and jazz to students of all ages. Why did the Arts Leadership Program interest you? At the time, I felt ALP would be a worthwhile supplement to my primary studies at Eastman. Like most students I spent long hours in the practice room. I felt it would be nice to balance things out a bit by taking a course that did not focus on my instrument or music making. Also, I felt the skills and way of thinking that ALP promotes would give a slight edge in my career endeavors. How did your ALP experience influence/affect your life as a musician? The skills and knowledge gained through the courses in the ALP program are very useful. However, in my opinion, the skills are of secondary importance to the ways of thinking that are promoted by ALP. The courses really made me consider music relative to the society in which we live. I started to ask more questions, such as: How do I reach a broader audience? How can I use technology to better communicate with students, fellow musicians, and audience members? How do I communicate the importance of music to a society in which its value is seemingly in decline? My attempts to address these questions have informed my efforts as a teacher and musician. Did the ALP change and/or enhance your outlook on your potential career? I developed an enhanced outlook on my career options, to a certain degree. I felt that all things being equal (if another candidate and I had similar training and equal experience), I would have one extra unique qualification. On the other hand, the curriculum of certain ALP courses provides very candid information as to the challenges that await music students. Such information does not necessarily promote an enhanced career outlook, but it is empowering nonetheless. At the very least students leave the course understanding what is necessary to reach their goals. How did the ALP help your career options? I knew that I wanted to pursue college teaching as I entered the DMA program at Eastman. In my particular case, ALP did not really help my career options as much as it allowed me to bring another qualification to the interview. More importantly, I feel that ALP has helped me to do my current job better. An entrepreneurial spirit drove a number of things I have done in my first few years of college teaching. ALP certainly helped instill that spirit. What are some of the key elements that an ALP certificate brings to an artist? The certificate, like most diplomas, does not even get you a cup of coffee. However, the courses in the program allow for the student to pursue any number of avenues. Each student will find different uses for ALP courses depending on his/her career goals and interests. Self–promotion, entrepreneurship, technology, grant writing (I would love to come back to school to take this course), artistic identity, career management, overcoming performance anxiety, outreach skills, audition preparation, and health are just some of the many possibilities. The relevant elements of the program will certainly change as technology, education, and music evolve. Based on its recent course offerings, it seems that ALP is committed to offering aspiring young artists information relevant to the time and place. What challenges face young musicians today, and what are some vital skills that could help overcome those challenges? Perhaps the most pressing challenge to young musicians is the number of jobs available compared to the number of musicians. The skill of self–promotion is essential. Ideally, we all would land an orchestral position, teaching position, or have plenty of freelance work right out of college. Obviously, this is not realistic. Hopefully, one has the communication and technological skills to sustain himself/herself creatively and financially until one has more stability. A more significant and distressing long term challenge to young musicians is the state of arts in general. We live in a world of instant gratification, short attention spans, and ever–changing communication. This certainly presents an uphill battle for musicians. However, with more universities developing programs in the model of ALP, there is reason for optimism. I don’t know if anyone really has the solution to overcome these particular challenges. However, I know that verbal communication skills (the ability to articulate and show why sitting through a Mahler Symphony or Coltrane improvisation is worth it) are essential. There are several ALP courses that address these skills. Regarding the changing communication formats, I think the ability to reach people using modern technology is essential. Also, we live in a world that is still pushing the importance of left–brain dominated education. This means less emphasis on the arts (and creativity) in grade schools. The concept of outreach (to young students and adults as well) is very important. Musicians in a position to affect this situation should be able to show a child why music is cool and convince his/her parents of its worth. Where did you serve as an intern during your ALP study? I served as an intern with the Rochester International Jazz Festival. Overall, it was a valuable experience. It helped prepare me to start a jazz festival at CSU, Stanislaus. What does Arts Leadership mean to you? In a general sense, Arts Leadership means understanding the state (and direction) of your art form and acting accordingly based on your personal goals or mission. You may be actually leading a group of students/musicians or simply pursuing individual career goals. Arts Leadership also means being an agent rather than an object. In other words, you can’t just sit and wait for your next opportunity. You need to make your next opportunity. Auditions and interviews will come and go. Even if you are the most qualified candidate, you may not land the job. However, you can always control the effort with which you approach the development of your art as a whole or individual career. Thankfully, courses in the ALP curriculum provide tools and knowledge to help us act. Häagen-Dazs Chocolate. No question. Chocolate Panda Paws from Corky’s on Monroe Avenue is pretty good too.